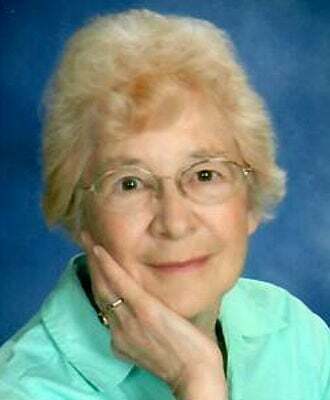 Agnes Schmidt, Fargo, passed away at the age of 87 on Jan. 27, 2019, at Colorado Assisted Living Home surrounded by family and under the care of hospice. Funeral Mass will be held at 1 p.m. Saturday, Feb. 16, at Holy Spirit Catholic Church, Fargo, with a visitation one hour prior. Burial will be in Holy Cross Cemetery. Agnes was born May 26, 1931, to Andreas and Veronika (Wangler) Schatz on their farm outside Napoleon, near St. Boniface Church. Agnes was united in marriage to Raphael Joseph Schmidt Sept. 15, 1952. The couple made their home in Fargo where they raised their two children. Agnes and Raphael enjoyed dancing, playing cards, and traveling to see their relatives and children. After marrying Raphael and moving to Fargo, Agnes attended Josef’s Beauty School and earned her North Dakota beautician’s license. She spent most of her career employed at Herbst Department Store beauty shop. Agnes was a member of Holy Spirit Catholic Church, the VFW, and Legion Women’s Auxiliary. She also liked going on walks and embroidery. Agnes is survived by her sister Carol Weigel; her children, Nancy (John) Gee and David (Loretta) Schmidt; grandchildren, Monica and Annemarie Gee, Andrea (Derek) Serlet, Michael (Xi Lan) Schmidt, and Daniel Schmidt; and by her great-grandson, Henry Serlet. She was preceeded in death by her husband Raphael, and her siblings Andrew, Anton, Joseph, Katherine, and Magdalene. Arrangements are entrusted to the care of Boulger Funeral Home and Celebration of Life Center, Fargo. To sign the online guest book, visit www.boulgerfuneralhome.com.